Classes for the Winter semester begin on Tuesday January 8. Youth Program: The Oakland Kajukenbo Kwoon Youth Program is traditional martial arts training for students from Kindergarten to Seventh grade. Students progress from white belt to black belt, building a powerful and practical skill set and deep connections with their training community. All Youth Program classes are mixed rank, meaning all levels, from brand new students to advanced students, are training together. Every Youth Program class includes a vigorous warm-up plus a combination of any of the following skill sets: Kajukenbo Kung Fu basics and applied basics, traditional forms practice, grappling, sparring, Eskrima, Northern Shoalin weapons and Kajukenbo Kung Fu requirements for rank. Youth Program classes also include discussion of the history and philosophy of the martial arts and fundamental, age appropriate self-defense skills training. 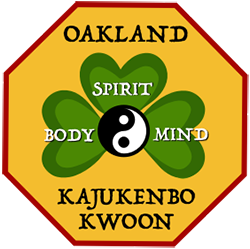 Teen/Adult Program: The Oakland Kajukenbo Kwoon Teen/Adult Program is traditional martial arts training for students from Eighth grade to adults. Students progress from white belt to black belt, building a powerful and practical skill set and deep connections with their training community. All Teen/Adult Program classes are mixed rank, meaning all levels, from brand new students to advanced students, are training together. Every Teen/Adult Program class includes a vigorous warm-up plus a combination of any of the following skill sets: Kajukenbo Kung Fu basics and applied basics, traditional forms practice, grappling, sparring, Eskrima, Northern Shoalin weapons and Kajukenbo Kung Fu requirements for rank. Teen/Adult Program classes also include discussion of the history and philosophy of the martial arts and fundamental, age appropriate self-defense skills training. The Saturday Kajukenbo classes are separated by rank. Advanced Class is for Brown and Black belts of all ages, Intermediate Class is for Blue and Green belts of all ages, Beginning Class is for White, Orange and Purple belts of all ages. Little Tigers is a beginning martial arts class for students age 3 to pre-Kindergarten 5 year olds. Saturday Kajukenbo Classes: The new Saturday schedule is organized to offer students a class focused on the material appropriate for their belt rank. These classes are for students of all ages, and are open for new beginners through advanced black belts. Saturday Kajukenbo classes can be a second class option for students who can only attend one weekday class or can be a third class for students who want to solidify material learned during the weekday classes. Little Tigers: Little Tigers is a martial arts class for 3 to pre-Kindergarten 5 year olds. Little Tigers develop agility, balance and upper/lower body coordination while absorbing a fundamental self-defense framework, the Five Fingers of Self-Defense. Little Tigers is a physical class meant to offer young children the powerful experience of striking, kicking, blocking and shoving. In an age appropriate setting, students discuss personal safety, setting boundaries, using their voice effectively and building an awareness of their network of support.